Rubber is a substance usually made from petroleum or from the Asian rubber tree plant. But rubber can also be produced from a domestic plant called "guayule." Guayule is a woody desert shrub cultivated in the southwestern United States as a source of natural rubber (latex), organic resins, and high-energy biofuel feedstock. Agricultural Research Service (ARS) chemist Colleen McMahan and her colleagues molecular biologists Grisel Ponciano, Niu Dong, and Dante Placido and technician Trinh Huynh, in Albany, California, developed improved guayule for rubber production. Last year, they delivered more than 3,000 experimental guayule plants to research partner Bridgestone Americas in Eloy, Arizona, for field testing. In 2013, Bridgestone Americas and ARS's Bioproducts Research Unit entered into a research agreement to evaluate ARS's genetically improved guayule. "The genetic modification increased rubber content dramatically in the lab, and we have seen that in the greenhouse as well," says McMahan. Their work with Bridgestone has allowed them to evaluate the plants and test them in the field. But a long-term goal is to supplement current guayule germplasm collections with plants that have important traits such as drought and disease resistance. The team needed to find guayule types that weren't already in ARS's collection. "Three years ago, a separate project with Cornell University was initiated to DNA fingerprint all known guayule germplasm in public seed collections that breeders rely on to create new types," says McMahan. "In the process, we searched for new—and old—sources to add to the collection," because this isn't the first time guayule has been used as a rubber source. 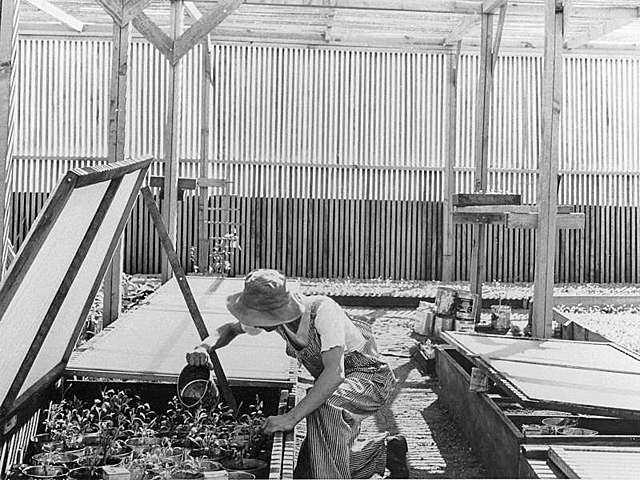 During World War II, Manzanar, California, was the site of a Japanese-American internment camp where guayule plants were selected, bred, cultivated, and processed into natural rubber to aid in the war effort. Manzanar is now a National Park Service Historic Site. "Turns out Manzanar National Park had plants and was willing to donate seed from those plants," says McMahan. She also collected seed from guayule plants at the home of a former Manzanar guayule breeder, Frank Kageyama. These guayule plants looked very different (silver-green lacy leaves) from most other guayule breeding lines (larger, deep-green leaves). 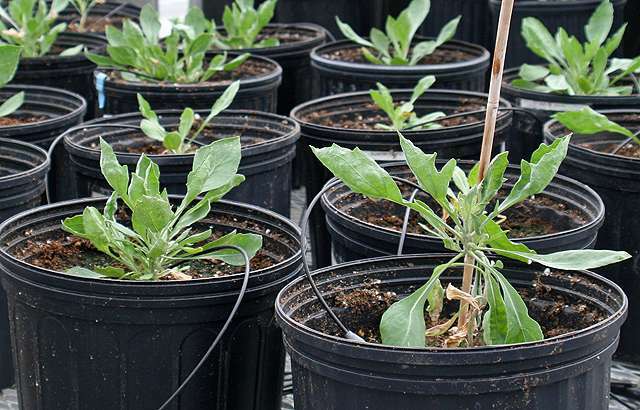 The plants grown from the Manzanar seeds are still under evaluation by ARS and Cornell and may provide an important source of genetic diversity in the germplasm. In the meantime, the genetic improvement program continued. In 2016, the ARS experimental guayule plants were ready for delivery to Bridgestone America's 180-acre facility in Eloy, where the focus is on developing guayule as a domestic source of natural rubber. "We packed close to 3,200 plants in tissue culture," explains Huynh. "These plants have unique DNA modifications that may translate intoincreased rubber and biomass. The plants are being grown and evaluated in Bridgestone America's greenhouse and field in Eloy." Since the route to Eloy isn't far from Manzanar, McMahan and team members returned to make a special delivery. "The curators of the museum asked us to provide some of the plants we had grown from the donated seed, so we delivered 33 legacy plants for planting in their interpretive garden." And for part of that trip, those plants carrying the history of the Manzanar guayule breeding program rode alongside plants that may carry the future of commercial U.S. rubber production.